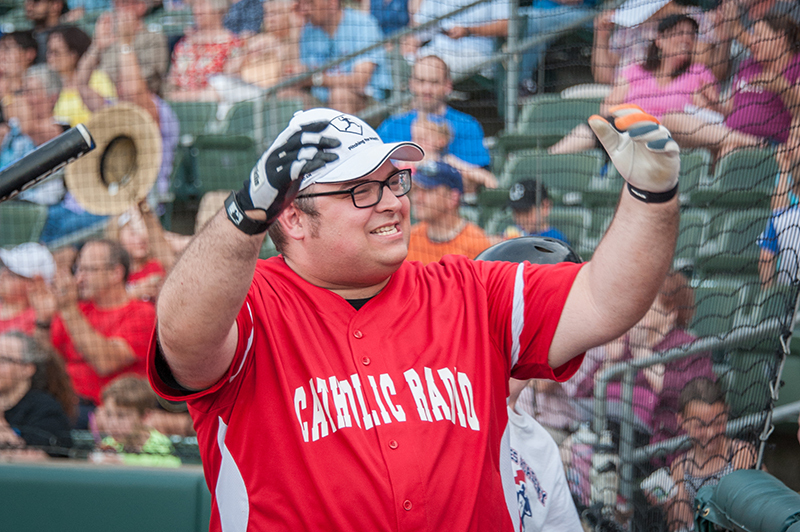 Father Andrew Strobl pumps up the crowd at a Pitching for Priests game. KANSAS CITY, Kan. — Don’t tell the players that the annual Pitching for Priests softball game is just for fun. Oh, there’s plenty of fun to go around. But once the game starts, these men of the cloth are all business, with just one thing on their mind: winning. “The priests are trying really hard,” said Father Scott Wallisch, outgoing archdiocesan vocations director and manager of the archdiocesan team. “They’re sliding, diving and running really hard. This is the fifth year for Pitching for Priests, the annual softball game between priests from the Archdiocese of Kansas City in Kansas and the Diocese of Kansas City-St. Joseph. It is sponsored by the Catholic Radio Network. The game is set for 7 p.m. on July 6 at Community America Ballpark, 1800 Village West Pkwy., Kansas City, Kansas. Tailgating begins at 4 p.m. The series is tied at 2-2, with the archdiocesan team winning the last two contests. Father Wallisch would like to make it three. “We’re playing to keep the trophy,” he said, in reference to the traveling trophy that is presented to the winner at the end of the game. For those unfamiliar with Pitching for Priests, the rules for this game are somewhat different than your typical softball game. It’s slow pitch and 10 men bat each inning, no matter what. That dynamic makes for some interesting gameplay. For the priests, the game is a rare chance to get together for camaraderie and competition. “The priests have a lot of fun, not only getting to see one another, but to encourage one another,” said Father Andrew Strobl, pastor of St. John Paul II Parish in Olathe. “We feel like a team for a day, which is awesome. For the priests, the game day atmosphere is second to none. With a usually rambunctious crowd and the fact that they’re playing on the professional baseball field at Community America Ballpark, the day definitely has a big-game feel. For Father Strobl, the fans make the game a special experience. “It’s somewhat surreal,” he said. “There is no way if I wasn’t a priest that this would ever happen. Tickets for the Pitching for Priests game are $12 for adults and $5 for children, and can be purchased online at: www.thecatholicradionetwork.com. Proceeds from the event benefit seminarian education.